When you’re a new blogger, you dream of the time when readers will visit your blog and leave a comment. Isn’t that true? You want the sign that someone has noticed, the social engagement, the “social proof” that your blog is worth stopping for. When I started this blog, the odd days when someone would leave a comment were wonderful, special. Getting that email alert was so exciting, I would drop what I was doing and rush over to see who had left the comment and what they had to say. Somebody cared! The idea that people really gather and discuss what you’ve written—even start talking among themselves—is intoxicating, like a dream come true for a writer. Over time, it can be difficult to predict which articles will inspire readers to write a comment, and a blogger can easily get this wrong. A post you slaved over because you were certain that dozens of people would notice your groundbreaking ideas, the elegance of your bullet points, the clear advice you presented? Maybe not so much. But the article you wrote in 25 minutes as the clock neared midnight, after you had dragged yourself into the office from a late dinner at friends’ and proceeded to just kind of spew out an article and hit “Publish”? Sometimes those can just take off. Given enough time, some articles just keep going and going, and it’s really instructive to try to understand exactly why that is. So I’ve gathered the articles on my blog that have the most comments, and tried to figure out what the appeal is of each one. About: Posted in the very first month of my blog, even before it was on thebookdesigner.com domain. This was fun to write and felt almost obligatory. After all, the blog is about book design, and everyone wants to know what font to use in their book. I picked the ones I use the most and wrote a pretty short article with a bit about the history of each font along with a sample of what the font looks like. Why: The conversation in the comments is almost nonstop. It seems that lots of people want advice about fonts, or simply like to nominate their favorites. The discussion has also been stimulated by regular contributions from other designers, notably Steve Tiano. People ask for advice or nominate their own favorites, and just this week someone left a link to a lovely free font for consideration. 2. Amazon and Lightning Source: The End of an Era? About: When Amazon changed their policies about stocking and shipping books from 3rd party print on demand suppliers, it upset the publishing model that was being used by many, many self-publishers. I used my own book, A Self-Publisher’s Companion, to chart the effects and wrote about the problem and possible solutions. Why: Lots of other authors had questions about what they should do with their print on demand books, and especially in the months following the change, many were looking for advice. James Byrd of Logical Expressions helped many readers in the comments and continues to advise people there to this day. 3. Top 10 Worst Self-Publishing Mistakes—Explained! About: This was one of those blog posts that just snuck up on me. I had published a kind of David Letterman-type “Top 10 List” a week earlier as something of a joke, a bit of entertainment in the midst of a lot of instructional material. When readers wrote asking for more of an explanation, I re-wrote the post with each point explained. Why: Unlike #1 above, which has accumulated comments over the years, this post sparked a number of long conversations in the comments where readers made some interesting connections with each other. Many of the comments ran several hundred words, so it became a “hot topic” for a couple of weeks and ran its course. 4. Print on Demand: CreateSpace or Lightning Source? About: This post was a response to one of the most common questions from new self-publishers. It’s also one of the shortest posts on my blog. 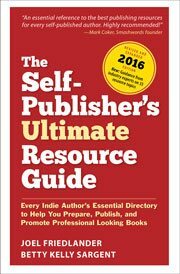 I attempted to set out as briefly as I could which types of self-publishers might use each of these very popular vendors. Why: It seemed like everyone had experiences with either one of these companies or both, and wanted to chime in. It’s one of the things that shows the power of community in social media. Although I had started the discussion off, many people made it into an extensive, thoughtful and thorough discussion, much of it facilitated once again by James Byrd. Great stuff. About: This article was instigated by the non-stop questions that come in about ISBN, a fairly simple subject that seems to confound lots of new self-publishers. I set out to ask and answer the 20 most common questions to create a guide for people that would persist, and where I could direct new inquiries. Why: The confusion about how to acquire and use ISBNs has not lessened, and in the comments there were some interesting discussions about ISBN and copyright, two unrelated fields. But the many comments reflect ongoing questions being asked and answered right up to the present day. What is there to Learn from these Posts? Each of these posts started with a fairly simple article, then developed into something else. This interaction, of course, is what makes blogging so distinctive as a written form. It’s difficult to think of a similar form of communication, where conversations take place over an extended period of time, and readers get the benefit of all the previous comments in learning about a topic. For instance, although the article about 5 Fonts is only 556 words, the comments add thousand of words about fonts and related topics, a cornucopia for those searching for information on what fonts to use in their books. It’s also notable how other people have been instrumental in providing guidance to readers, and you can see how indebted I am to Steve Tiano, James Byrd, and all the other commenters who have made the blog comments here a true community effort. My thanks to all of them, and to all you readers for asking the questions that fueled all this energizing conversation. So let me ask you: What’s the biggest topic you’ve had on your blog, that one that got the most comments? Leave a link, too, so we can have a look. I to am very new to blogging but enjoying it so much and it had encouraged me to do more writing. My best post was on History, just a short one on how things have changed. I only had 11 comments but it meant the world to me. I would like to know if I am doing it correct as there is no way of knowing I guess until you get a lot of followers. I have for Face book and Twitter so I am building my platform, I am also just completing an Internet site. I think the Nanny Cool idea is a good one, I just have to do it right I guess? I know I’m quite behind the game, seeing as though this discussion started in July 2012… but here goes! I’m sitting here today researching how to drive traffic to my blog, guest posting, and how to see an increase in the comments! Thanks so much for this insightful post. Heck, at this point I’d be happy with *traffic* to my blog, let alone comments! Granted, I only started it about a month ago, but it’s an effort to establish my “author platform” that I keep reading about. I’m not writing a blog to help other writers (although I did recently add a page on writer resources – and included your most helpful blog in the list), but rather to attract prospective readers. Not that I don’t want to help fellow writers, but I don’t really speak from any great authority on the subject. The purpose of my blog (perhaps misguided), is to chronicle the writing and publishing of my first novel. The tone of the blog will change as I complete the book, have it edited, cover designed, formatted, published, etc. Maybe I’m just impatient and the traffic – and the resulting comments – will come in time. In any case, thanks for the great resource you provide. Way to go, Denise! It’s just a matter of time and perserverance. upon it for him… lol. So allow me to reword this. Wow, I can wish for 100 comments, but the most I’ve received, says WordPress stats, is 27 (but that includes my replies, too). It also received 5 likes, 2 five-star votes and one tweet. In it, I talked about removing the word ‘some’ from my writing. I have experienced similar results as you. Posts I’ve worked long and hard on at times get few comments, while ones I threw together at the last minute generated lots of comments. Weird. I left this comment, but it appears to have gone into never-never land, probably because of the name of my site -Everyday Underwear – I go into spam filters a lot if I haven’t asked them to whitelist me (please do – I’d like to be able to comment on your site), so I’m trying it again without my website. The posts I thought would get the most comments… didn’t. For instance, I did several serious pieces about a friend whose brother was killed in November 2011 in Afghanistan. Hardly anyone commented, even with running the pieces near/on Memorial Day. Perhaps I just need another blog all together for serious content only? Ah, but that sounds like too much work! And thanks to all the commenters Re: disqus. I’ll be looking into it. I had intense debate/commentLuv installed on my Blogger blog. It was a bit bulky, and difficult to navigate for those not registered w/that service. Joel, thanks for the tips. Like Ros, my blog falls under the “personal” category, although I usually try to include either useful information or some sort of opinion that might spark conversation, and invite questions or cooments. Most of my comments as yet are friends and family who are being supportive and I’m thankful for that. But I look forward to the point at which total strangers will find a post interesting enough to take the effort to hit the “reply” button. Heidi, I really like the clean look of your new WordPress install, good luck with it. I’m a big WordPress fan myself. I think that “personal” blogs are harder to get traffic and comments on, but on the other hand they are usually the most fun and rewarding for writers whose interests range over a variety of subjects. Getting a lot fo comment your blog and building a community is the ultimate sweet spot for bloggers. I read the exchange you had with William Mougayar and he is spot on with his recommendations about how to get more comments to someone’s blog. If you are part of a community of commenters, they will read and comment on much of what you write. Also, I am big fan of Disqus because of its integration with Engagio where I am engaging with most of my social conversations. Livefyre is also great and I believe Engagio is working on integrating them soon. Thanks, Abdallah. Since this dicussion I’ve been looking into both Disqus and Livefyre and I plan to install one or the other over the next few days. I enjoy the comments as much or more than writing the actual posts, so I’m super interested in something that will make commenting a better experience for readers. My latest blog about early retirement got the most comments. Not surprising lots of congrats…more surprising was that several younger readers connected with the insights and even shared on Facebook. Loved that readers of many ages felt a connection with my writing. It is both amusing and annoying that the blog posts I spend 10 minutes just “throwing together” end up being such a success, and the ones that I put all of the attention to detail into get very little feeback. Proof that we should be a little less hard on ourselves as writers, I think. And I’ll be going through to read these articles you’ve shared with us when I get a chance later today. I’m sure they’re all quite brilliant, we can only hope to be where you are someday! Katie, that happens to me, too. Sometimes I over-think stuff and those posts tend to come out a bit remote, if you know what I mean. The ones I write quickly are more often gut responses or things that I’m passionate about, and that may account for people’s reaction to them. http://uspandey.com/2012/05/06/tat/ (112 comments) -this one took me by surprise, just as you said in your post above. Of course, my one-star reviews always gather more comments than my five-star reviews. The biggest comment magnet was when I gave a one-star review to John Locke’s book, HOW I SOLD ONE MILLION EBOOKS IN FIVE MONTHS. It wasn’t just that I disliked the book, I thought the book made all indie writers look bad. My readers chimed in. The majority agreed with me. Really glad to find out about your site, Margaret, that’s a great niche to cover. One of the exercises we did in “blogging school” was write a post that publically disagreed with an A-list blogger, and it resulted in a lot of comments for me at the time, so I’m not surprised at your result. Thanks for chiming in. Hi Joel, great post. There is no magic formula, but a few things resonate with me. – My readers know I always respond to comments, and that’s an important thing for bloggers to do if you want people to comment. – I also do not moderate my comment box, making it as easy for readers as possible to see their comments go live. I have one post on my blog with over 390 comments but that was an anomaly as part of a blog hop. This one written right after the death of Steve Jobs came in at 53. Eden, your post on Twitter struck a chord, I think, because we all share that experience of running into people who seem to be clueless about social media, and you also revealed something of yourself in your correspondence. I enjoyed it. Yeah, it’s definitely a craft but you’re in a huge and I think growing area, writers, offering tons of great advice so it’s generally all good and the comments just make it better, making it a regular stop when reviewing feed updates. I write more of a business/product blog, so haven’t gotten near the comments, plus still fairly new so making lots of mistakes, but it feels it’s getting better, easier, more fun, just with regularly putting something out there, after awhile you start working on other aspects, albeit not much faster than turtle most days. Also nice to hear a bit of your early days, don’t feel like you’re necessarily doing something wrong with not hitting a home run every time, :). Matt, it can be confusing when you start out, and how to attract the people you’re aiming to and what are the most effective strategies, how you prioritize the myriad tasks you need to do on a regular basis all comes into it. In fact, just to “open the kimono” a bit, I’m currently developing a training site for authors who want to really use their blogs as marketing, engagement and conversion tools. If you’re interested in that kind of thing, make sure you’re on my mailing list (not the blog subscriptions) and you’ll hear about it when it’s ready. Thanks for letting me comment, Joel. Love your blog, as always! Ilana, I really liked your post and you made some great points in it about the nature of happiness and how to approach it. Headlines, as noted above, are crucial and I suspect you’re right. But since your blog is really an author’s blog and not specifically a lifestyle or self-help blog, browser probably don’t know that you have that kind of content. I am SO new to blogging so I submit this with humility. Love reading your great posts!! Ros, I thought your post was lovely, but it’s always going to be more difficult for “personal” bloggers to get traffic and comments. That’s fine, depending on what you want your blog to do for you, but if you keep going and letting people know about what you’re doing you’ll slowly attract a community of readers. I am a newbie, so I’m still waiting to hit double digits for comments! It’s interesting to me that my most visited post and my most commented post are not the same. Do other people find that’s true as well? This post http://inspired2ignite.com/2012/06/26/small-kindness-big-impact/ received my most comments and I think it’s because it is a subject less vulnerable that my others. The post that recieved the most visits was related to my guest post on someone’s established blog, so of course I understand in this case that answers my question. But, even without counting that post I still have the same discrepancy. Denise, I think your ability as a storyteller really came through in that post, and I’m not surprised that readers responded. I don’t see much correlation between comments and pageviews. Some posts on my blog that are more reference-oriented get tons of views but hardly any comments. Controversy, vulnerability, confession, confrontation are all things that will spur comments, and you can’t have those every time you post. Thanks for your feedback on my post. I think your observation about what spurs comments is true. I hadn’t thought about it in concrete terms like that. It’s helpful to understand the discrepancy between comments and pageviews. I’m new to your blog and enjoy you making me think outside the box! Most of those comments were about whether or not this “worst advice” was actually good advice for some, i.e. give up!, or whether it was an act of cruelty piled onto an already cruel world. Well, Dan, I think your headline really helped, and that’s a big part of what draws people to blog posts. I also liked the “stick it to them” tone with which you fought back against the naysayers, and we all want to be part of that. The surface answer to getting a lot of posts is to have a topic that is timely and relevant to a number of people. If you can write something that will strike a nerve or be on topic for something important happening now, you will likely have a lot of discussion. However, I find that bloggers are often cutting edge in their thinking and publish nice articles before their time. People will search for a given topic and stumble upon articles that are sometimes years old. If you want to discuss this issue, you are pretty much in the cold, as the thread will get no visibility and no reply. That is a real problem for blogs and bloggers. After the topic becomes 2nd or 3rd down the front page, it’s all but ignored. This is counter to the BBS/Forum model that facilitates discussion much more fluidly. I have found threads on discussion forum that were years old. Resurrecting them brings them back to the top of the list and that topic gets attention again. Sometimes, a topic, which was prophetic or not yet relevant, becomes a talking point. The value comes back because the topic is now relevant to the readership and its content is in demand. On a forum, since there is visibility again, the topic gets the replies and comments start flowing again. It becomes a useful tool for the readers instead of an old, dead thread. With blogs, that topic stays buried. Unless the blogger is keen to resurrect the story, nothing happens. You lose that opportunity to get the discussion and audience engagement. You are a WordPress user like me, which makes content management super easy. I just wish there was a way to have a list of articles or topics that are getting attention again and bump them back up to a place where they are visible. I think it would add a lot of value to a site where there is a lot of useful content. Good point, Tracy, and that’s one of the reasons widgets like “Popular Articles” are so… popular. Two of the posts mentioned here appear in the widget in the left sidebar, and that’s one reason they keep getting comments. But I also think that search brings readers who see the discussions are ongoing so don’t hesitate to dive in, as in some of the articles talked about in the post that continue to get comments for years. Also one of the reasons I installed the “Start Here” widget, to create subject-specific landing pages that are visible all the time. A key thing in having lots of comments is to engage with your commenters on a regular basis so that returning users start to get a sense of being part of a community. This post received 127 comments on my blog http://blog.engag.io/2012/04/15/social-gestures-and-the-social-web-part-i/ because a lot of the participants were from an existing community (AVC.com) where I’m a top commenter. Actually, if you are an active commenter and would like to see manage a unified view of your commenting activity on blogs and social networks, look at Engagio. It’s great for discovering new communities as well. Joel- btw, have you thought about adopting a more open commenting platform such as Disqus or Livefyre? I think it would help lubricate your commenting activity even further. Disqus is one of the best things to happen to blog commenting in a long time. The ability to manage multiple sites is boon for the end user. It also opens up the door for new people on the site who already use Disqus to jump right into the conversation. I implemented it on my blog in about 10 minutes, as there is a Disqus funded and developed WP plug-in that replaces the existing WP comment system. William, of course you are right on the money. Blog readers are savvy about which bloggers really want to interact, and that’s a big stimulus for comments. For instance, I often invite people to ask questions in the comments and over the years lots of people have gotten help that way and the results are there for any visitor to see. Loved your article, by the way, and thanks for the tip about Disqus. I’m right in the middle of writing up design changes to the blog and will look at it. Thanks. The other advantage of being on Disqus is that your blog will enter Engagio’s Discovery chain, and users will discover each others conversations that way. The daily discovery email has been very popular and we have seen feedback where bloggers see a jump in commenting activity because community members are mobile and are loyal. They will migrate where their friends are commenting. It really does make things easier for following other commenters too. Another great feature is the ability to see a digest of your activity in real time on the Disqus console. The “Like” functionality is nice too, as it encourages comments that are more thoughtful. Single sign-on is a plus too. From an admin standpoint, they do give you quite a few admin features for managing people and getting rid of trolls. Oh, you will, Matt, you will. Just keep going.